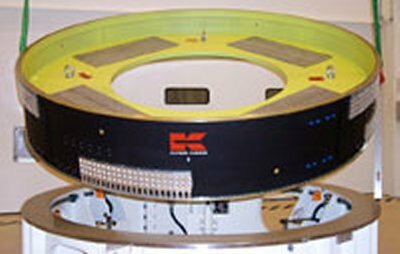 6 Modular Fitting Dummies (MFD) ring-shaped 700 kg modules were primarily designed to adapt the payload mass of the first flight of the new Ariane-5ECA in October 2002 to the new powerful performance. They were manufactured by Kayser-Threde. The set of six 700 kg Modular Fitting Dummies (MFD) had been shipped to Kourou in June 2002. It consists of four MFD 500 and two MFD 325 (the figure indicating the ring's height in mm). The modules can be reduced in mass by 150 kg each by removing trim-masses. The concept of modular dummies allows Arianespace to respond to the respective flight configuration of an upcoming launch. The MFDs remain attached to the upper stage or the upper part of the SYLDA-5 adapter. Ariane-5G (V-155) carried a MFD-500. It was mounted below the primary lower payload, the MSG 1. Four Kayser-Threde modules (two of each type) at one time were launched on Flight 157 on an Ariane-5ECA.